Not an exciting photo today. Generally I find samplers full of possibilities, but this time I’m just not sure where to go next. Earlier I mentioned that my first project on the new ashford table loom would be a sampler using silk chenille from Beautiful Silks. The sampler is in 3 sections, sleyed at 10, 15 and 20 ends per inch. I used 5 different wefts – the mulberry chenille as in the warp, tussah ribbon yarn, fancy spun silk, 20/2 silk and 12 ply silk sewing threads. The 20/2 silk was from Walters Import, the rest from Beautiful Silks. The 10 epi sample was all plain weave, the 15 epi was plain weave in each weft then 2/2 twill in each weft, the 20 epi 2/2 twill each weft. yarn machines, where cut pile yarns are inserted at right angles to the core yarn surface to create a surface in which the fibres contained in the pile yarns burst and form a soft pile surface to the yarn.” Follow the link to the paper to see a nice diagram of this. The result is that the yarn is unbalanced – lots of excess twist. First impact – I couldn’t tie temporary knots in warp and I couldn’t just let them go. The ends would just frizz and tangle crazily. I ended up using metal hair clips around groups of ends for temporary holds. Second – when I got to the 2/2 twill section I wanted to add a floating selvedge. I put in an extra thread at each side, wound on a plastic bobbin and individually weighted. Dangling behind the loom, the yarn spun and untwisted, giving me spots with 2 empty core yarns and the cut pile drifting to the floor. Here is my improvised fix – a cloth held under the loom’s feet and falling behind the selvedge ends meant that the yarn bobbins couldn’t turn, so the yarn couldn’t untwist. Third – see photo at right. I now know what people mean by “worms” in chenille. This section is 10epi, 12 ply sewing thread weft. My hem stitching didn’t stablise the end. After a gentle hand wash and press I was disappointed by the feel of the fabric and for some reason thought that throwing it into the tumble dryer would be a good idea. Oops. On the plus side, I enjoyed using the new loom. Things moved smoothly and held firmly and it was overall very pleasant. It’s just – I don’t know what to do next with any of it. None of it has the soft, luxurious feel I was hoping for. I’m also daunted by the natural colour. I was planning to dye warps, but I can’t imagine being able to without getting into a horrible tangle. In my mailbox this week – Daylilies, by Beatrice Jackson. It’s a cotton & linen mix, handwoven and hand dyed (arashi shibori). “… [trying out so many of the weaves] …reminded me of how I was when I started out in 1983/84. I was weaving in wool and mohair in those days, for NZ conditions. Made a lot of throw rugs, scarves, wraps, even mugrugs in dishcloth cotton!Then I went into weaving fine fabrics for entries in the NZSWWS, (now Creative Fibre), Fashion Parades. One friend was a very fine spinner and dyer, I was the weaver and another was the designer. We had work accepted in several exhibitions and fashion parades, which was very good. “Began doing painted warps which I loved doing. 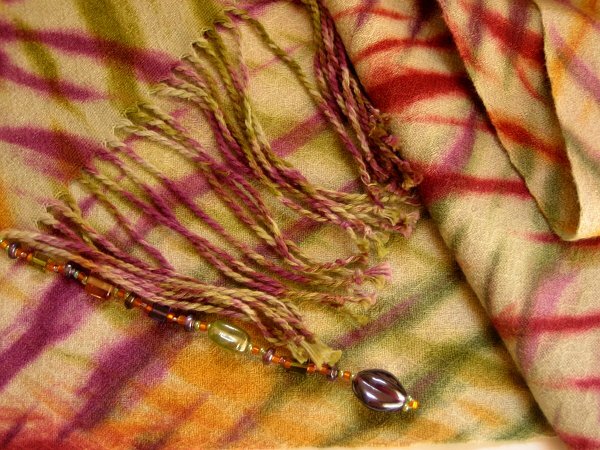 “Shibori came in to NZ at a time when it wasn’t possible for me to get in to so it wasn’t until I moved over here, that I began doing Shibori and it suddenly gave me what I wanted to do, expressing my love of nature and the use of colour. 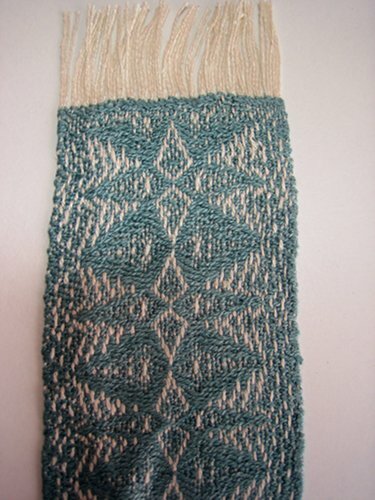 “I began weaving in cotton, tea towels and hand towels rolled off the loom! I love twill, so many patterns to do. Don’t get to do many now. I met Beatrice through ATASDA. You can see another of her pieces here – towards the bottom of the page (a donation to our raffle). That link also leads to galleries of textile art work from ATASDA’s recent Exotica travelling exhibition. It’s beautiful work – very fine weaving, complex dyeing and clever use of colour (which my camera and photography “skills” struggled with). When I saw Beatrice in Brisbane last September I begged her to sell me a scarf, any scarf – everything I have seen made by her has been exceptional and I trusted her choice. (another link showing Beatrice and her work here). 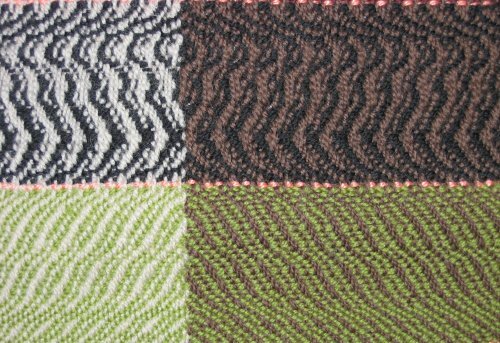 “Advancing twills are another name for “skip” twills… they are wonderful design tools for creating large patterns.” (class notes from Liz Calnan). Earlier this year the weaving class worked on advancing twills. Liz took us through a series of exercises on paper. Looking at this threading example (right to left), there is a run of 5 threads using shafts 1 to 5, then another run of 5 starting 1 shaft up, 2 to 6, then another run and so on until it repeats. So that’s a 5 end block, left twill, advance 1. 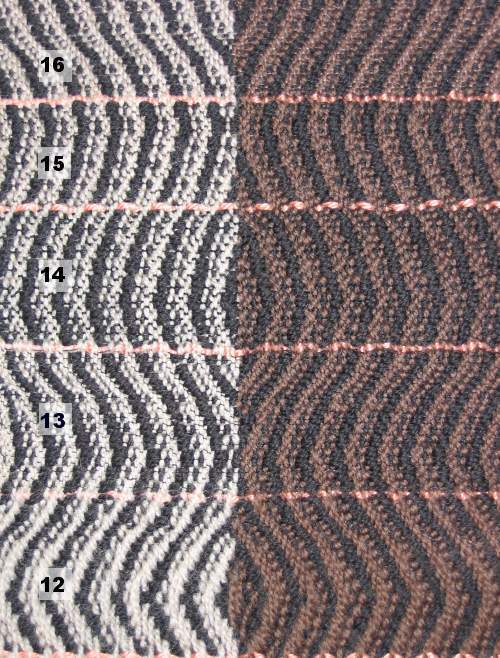 We tried varying the number of ends per block, left or right twill, and advance. Some combinations don’t work – a simple example being a 4 end block, advance 4. You’d never use the other 4 shafts. 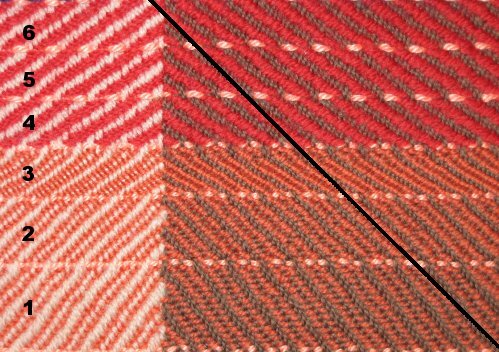 Liz also advised us to choose a combination that works for plain weave for more colour combinations when weaving – warp dominant, weft dominant or mixed. Next design choice is tieup. Liz’s tip here is to restrict the length of the float to one less than the number in the run, to avoid huge floats in the weaving. She also suggested we try part of the tieup upturned, giving areas of left hand twill and right hand twill for more interest in the cloth. 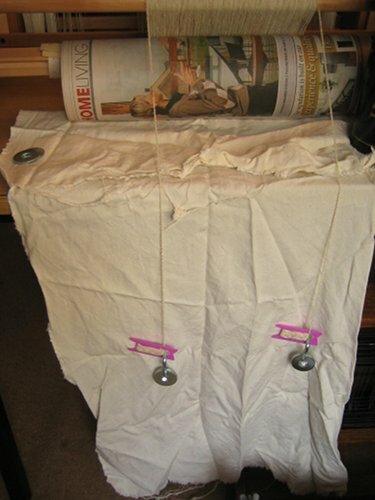 Treadling can be as drawn in, or straight or … well, best to try things out and see (preferably on the computer!). Just remember to check regularly for floats on front and back. I went into more detail in drafts 1 and 2 of this post – both eaten by the technology in different ways (and different levels of user clumsy fingers). So if you want something on expanding the threading and transition ends, leave a comment and I can try again another day. Faced with all these design possibilities … I opened a book! 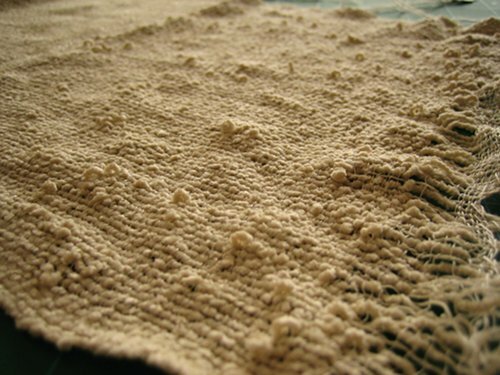 The best of Weaver’s Twill Thrills which has Doramay Keasbey’s article frost crystals in twill. I used one repeat of her threading, with just a little sateen threading at the sides. Silk bookmarks in 20/2 silk, the weft various colours I’ve dyed in the past. I really didn’t enjoy this weave. Liz had kindly lent me a Padget 8 shaft table loom which had recently been refurbished – it and I just didn’t get on. Another shot of the bookmarks (sorry about the dull and inaccurate colour) shows the results of problem 1. The cloth beam is varnished and my ties kept slipping when I tried to put any tension on the loom. The bookmark on the right was the first woven. It has an extra repeat and is still very short (and thick and ridged). I cut it off and used some rug grip around the cloth beam which solved the slippage, but still found I was unable to get into a comfortable rhythm. I think partly it was the arrangement of the levers to lift the shafts (not what I was used to), partly I was unhappy with the sett I’d chosen especially at the selvedges, my variable beat, and just lots of other little niggles. 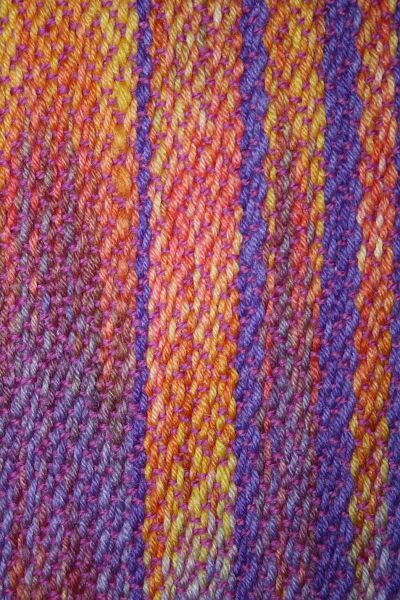 Closeup of bookmark #1, in all its ridge-y glory! I’d planned a dozen bookmarks as gifts and a couple went quickly, before I took the photos. These ones are “resting” in a folder – I’m not at the stage I could give them away without fussy apologies. I think I could do better. The last few were never woven – life is too short and weaving time too precious to stick with something that just isn’t working. There are lots more possibilities out there! 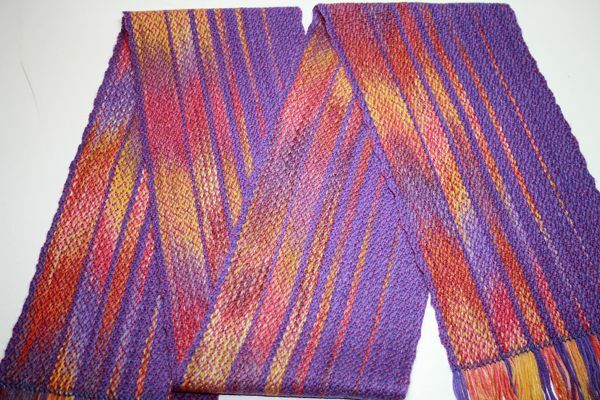 This is the completed scarf, from the same warp as the sampler I wrote about here. 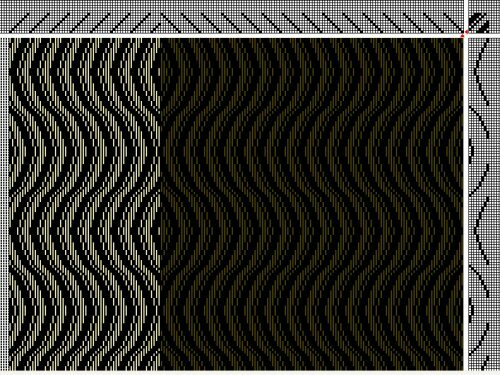 I spent some time in Fibreworks PCW, trying to modify the sine curve pattern to avoid long floats without having to resort to an extra tabby weft (since I didn’t like the impact on look or handle in the sampler). What I ended with, after washing and pressing, is a long way from the original design. Instead of a sinuous vertical line along the length of the fabric, I have an angular line. 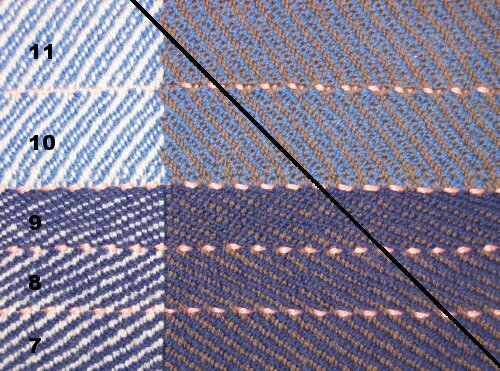 The straight twill at the pivot point of the “curve” has become a horizontal band which is very apparent both visually and to touch. be careful the conclusions you draw from a sample. I didn’t like the moss green section of the sample and was worried when my MIL chose that colour for the scarf. I love the colour in the final product – maybe the yuk pattern or the impact of other areas of the sampler put me off. Although it didn’t go according to plan, I love the end result. It drapes nicely and to my eye has an elegant and classic look. Twill weave structures were the second project we did in first year weaving class in 2008 – you can see a very boring photo here and a somewhat better view here. 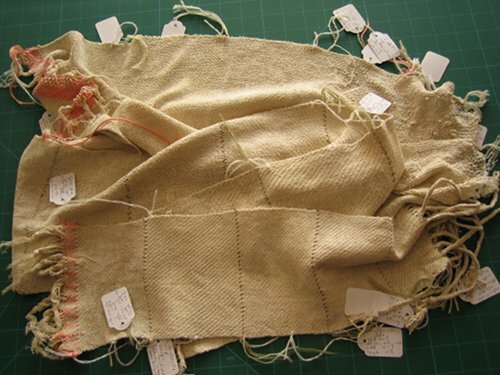 (red herring – it’s fun going back to an early post and remembering the bliss of discovering that I could create cloth! I still find it amazing). In the last couple of weeks I’ve been working through a second year exercise – undulating twills on 8 shafts. An aside – I began this blog with a self-focused primary purpose – a record of my progress learning to weave. It’s a nice bonus if it’s of interest or help to others but there’s bound to be mistakes (learning process), so corrections and suggestions are always very welcome. 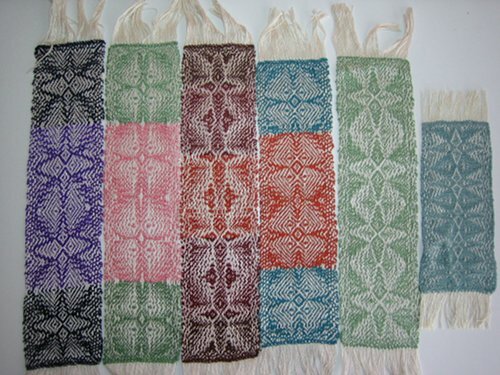 Information from the Handweavers’ Guild of America’s website describes twill structure as loom controlled with floats formed over at least two threads, offset with every shot (see HGA’s Weaving Structure Classification). The classic example is denim jeans, with the offset causing a characteristic diagonal slant in the appearance of the cloth. The start of my original twill sampler shows a 2/2 twill. 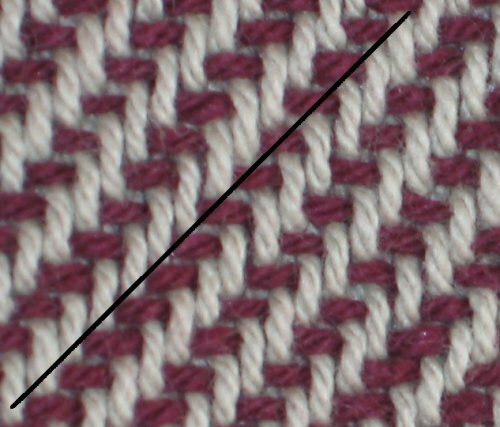 The (reddish) weft goes over two threads then under two. The next row up does the same thing, but shifted over one warp thread. In theory if everything is done just right the slope should be at 45 degrees (shown by the black line). Hmm… well, where would the interest be if it was easy? 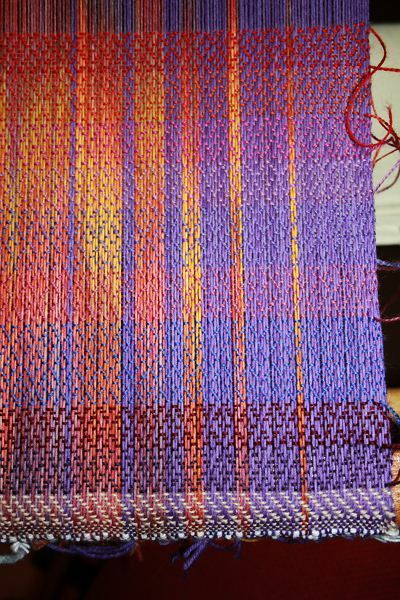 You’ll have to cut me some slack since this was the first centimetres of my first twill weaving. (3) heavy – 32 ppi. You can see the twill angle getting more acute as the beat got heavier. 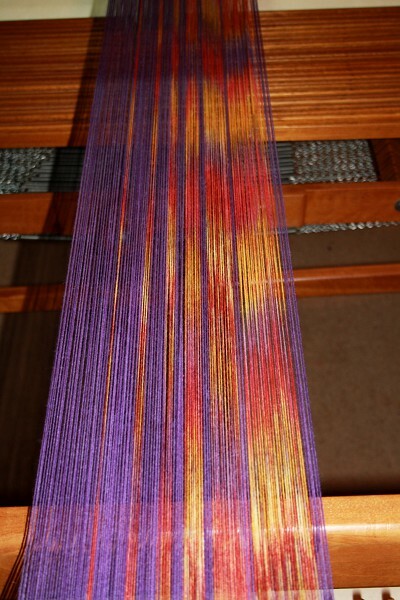 * Varying the warp tension – how tightly stretched the warp is as I’m weaving. If it’s tighter I should end up with more picks per inch in the final, relaxed cloth. Sections (4), (5) and (6) are sections of increasing tension. I found this tricky, since everything gets sloppy and difficult if you go too loose and I fretted about things snapping if I went too tight. (9) missed every 2nd row. (11) repeated every third row. 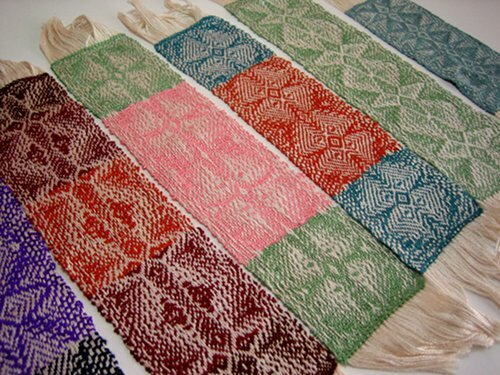 Again I found the weaving challenging – repeated rows slide together easily, when skipping a row the picks keep away from each other. I wasn’t within cooee of an even beat. My selvedges were also wildly uneven (not shown – there are limits!). I also find the jagged edges of the twill line visually distracting – like a pixelated photo. There are other methods not included in the sampler. * Varying the threading. Everything above was on a standard straight threading, shafts 1 through 8 and repeated until arriving at the cream section and reversing to 8 through 1. Liz (weaving teacher) supplied notes and drawdowns showing the impact of skipping or repeating threads in the warp instead of, or as well as, the weft. * Varying the denting. My sampler was 18 warp threads in every inch, threaded as evenly as I could (given I only have a 10 dent per inch reed). Liz showed us a stunningly beautiful sample of “crammed and spaced” twill, where the number of threads per dent varied from 1 to 3 in a long, smooth progression. 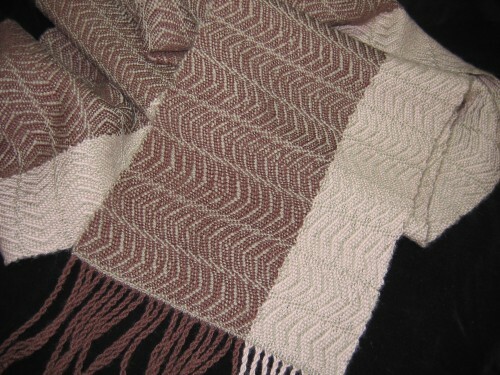 The sample was in undyed silk and the final product was a wedding shawl. * Playing with colour, lustre and texture. Opportunities for optical tricks. Having tried basics, the next step in the sampler was to mix up some of the techniques. The green section here used a combination of skipping and repeating rows. For the black weft section, I used a line based on a vase I have. I drew it on graph paper and reduced it to fit 8 shafts – if the line fell on column 2 of the graph paper, that meant lift 2. If the line fell on column 8, that’s lift 8. If it fell on column 9 that didn’t fit (I only had 8 lift combinations), so it’s wrapped around and becomes lift 1. Column 10 wraps to lift 2 etc. Clear as mud?? I really like the line it creates but there were some long warp floats which can cause problems in use. Next up in burgundy another design from Liz’s notes. The green is another from me, trying to create a design while avoiding some of the things I found unappealing earlier – long floats and jagged lines. The result is a definite no! I haven’t gone into the variety of twill lifts – another design choice where you try to balance appearance (clear strong lines) and practicality (eg floats). 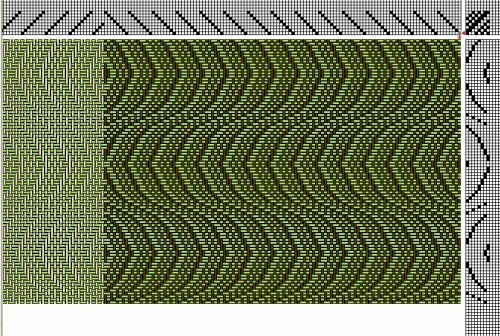 The final section of the sampler are four variations of the same “sine curve” sequence I found in Liz’s notes, originally from Handwoven November Decemaber 1989. (12) was the sequence of lifts from the notes – a nice shape, but very long floats, even after I adjusted the design a little to remove some of the repeats. (13) followed the note’s suggestion of a pick of plain weave between each twill pick. I used a black sewing cotton – visually disruptive and harsh to feel. (14), (15) and (16) all used fine threads from cone ends I picked up at an ATASDA meeting. (14) is darkish brown, (15) mid brown and (16) light brown. I don’t know the fibre content, but they were quite loosely plied and the impact on the handle of the fabric is not so strong. I think visually the light brown is the least intrusive. * I made some adjustments to the loom, replacing some of the ties to texsolv. I’m continuing to improve my warping process. * lashed on the warp instead of tying on. I’m somewhat clumsy and found this much easier. 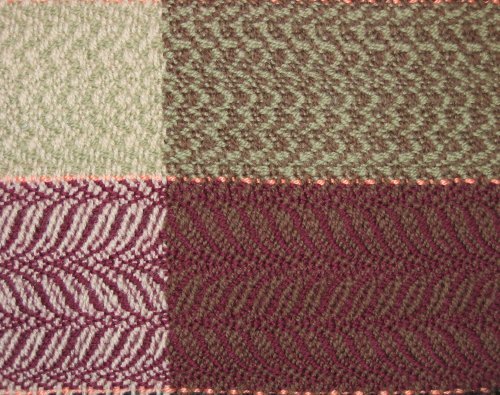 * My warp was long enough for a project – a scarf – as well as the sampler. In the past I’ve cut off a sample, then retied for the next section. This time I tried a process based on Leigh’s example using a 2-stick heading. It got ugly at times in the process (see “clumsy” above), but I did get good warp tension throughout. 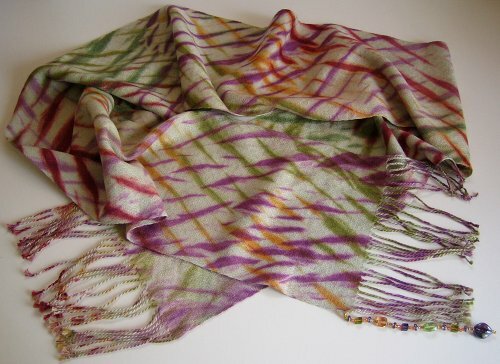 * Colour challenge – I chose neutral warp colours, and experimented with the interaction with different weft colours. The project scarf came off the loom this morning. I’ll post a photo when it’s washed and finished.